I’m a professed Marvelite. When the question “DC or Marvel” comes up, my allegiance is always with Marvel. But in spite of that, there is one DC show that claims a special part of my heart. Six young heroes—Aqualad, Robin, Kid Flash, Superboy, Miss Martian and Artemis—the sidekicks of the heroes of the Justice League, come together to form a team of their own, to do the missions the adult heroes can’t, in secret and in plain sight. Their adventures, missions, trials and triumphs are Young Justice, and here are five reasons to experience them for yourself. 1. The characters are nuanced and well-written. When we meet the six main characters, they are already complex and compelling, but they grow and mature over the course of the show. Each of them are showcased and given the chance to win a place in viewers’ hearts. For example: Superboy, a.k.a. Conner Kent, was given a backstory that differed a little sharply from the "Connor Kent/Kon-El" of the comics. He was cloned from Superman’s DNA and speed-grown in sixteen weeks by the mysterious and unscrupulous organization called Project Cadmus when he was discovered and rescued by Robin, Kid Flash, and Aqualad. Over the course of the show and with the help of his teammates, Superboy learns to define and discover who he is as a person and chooses for himself the name Conner. I personally find it intriguing and different that Conner only has super-strength, infra-red vision, limited invulnerability, and can only leap tall buildings in a single bound. Yeah, he can’t fly, and he doesn’t have heat vision. To me that makes him more real and more accessible—and closer to Jerry Siegel and Joe Shuster's original vision of Superman. 2. The villains are fresh and less clichéd than usual. Let’s face it—in superhero animated shows like Young Justice, the villains are usually all about beating the heroes and “taking over the world” and causing as much mayhem and chaos as possible with no better motives or reasons. The main villains of Young Justice are a shadowy and villainous circle of figures who call themselves “the Light”. They and their compatriots do cause a lot of chaos and mayhem, but usually they do have believable and plausible reasons for doing so. One of their number—Klarion the Witch Boy, a Lord of Chaos who seems to be pretty much a spirit of evil magic—orchestrates a powerful spell that splits the world into two dimensions: one for the children and one for the adults. The heroes defeat him—at a price—but it’s revealed that Klarion’s magical display was no more than a smoke screen—a diversion so the Light could steal an object vital to their plans. When villains actually start finding direction and traction with their plans…things start to get a little scary, don’t they? 3. The problems, the struggles, the obstacles are real. Again, unlike a lot of superhero and “kids” cartoons and shows, the writers and showrunners don’t insult their heroes’ intelligence—or ours. The missions that Batman sends the team on challenge them to the best of their abilities, and it is never without a struggle. And just like in real life…there is tragedy. And loss. In the aforementioned fiasco with Klarion the Witch Boy, the team was losing—badly—so their friend Zatanna donned the Helmet of Fate, which enabled the legendary Lord of Order—Doctor Fate—to possess her and help defeat Klarion. The price was that Fate refused to release her, for he is the mortal enemy of Lords of Chaos like Klarion and he was convinced that the world needed Doctor Fate more than a little magician’s apprentice like Zatanna. Her father, the seasoned Justice Leaguer Zatara, offered himself in his daughter’s place as a stronger and more suitable host, and so Zatanna could be free to live her own life. The bargain was accepted, and Zatara was lost to Fate. Before this moment, Zatara’s appearances could be counted on one hand, but even so, for me this episode hit hard, and needless to say I bawled my eyes out. Of course, it didn’t help that Zatara was voiced by one of my favourite voice actors, Nolan North. 4. The fresh, exciting storylines. 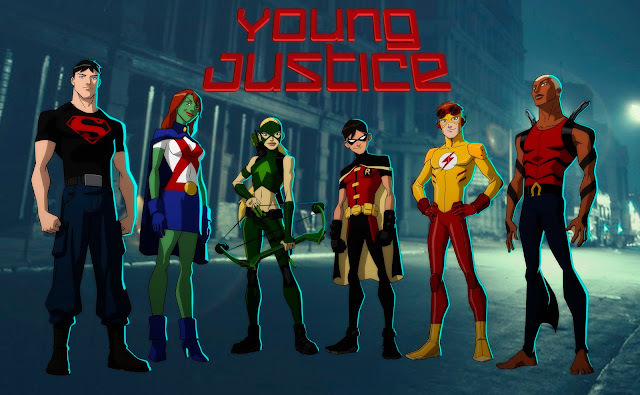 In an environment in which networks seem to be introducing more and more kid shows with shorter and shorter run times and less serialized arcs, Young Justice invited its viewers to put every episode under a microscope and speculate and theorize on which side Artemis was playing for, who were members of the Light, and what their endgame was—among many others. In Season 1, each member of the team got an episode that centered around them and focused on their individual, personal struggles and problems and showcased each of them for who they were and whom they were growing to be. And all the smaller story lines are masterfully woven into the larger arc of unmasking and defeating the malevolent Light. No episodes are filler, and even though they’re not all home runs, the writers and showrunners consistently deliver a satisfying conclusion to each arc. 5. The equal racial and gender representation. It’s a none-too-pretty truth that when comics first started, it was a mostly white man’s world—and for a while, a man’s world. In recent decades, things have gotten a lot better in that regard, and Young Justice is excellent proof of that. When the team starts out they have two girls in their ranks: one a Martian and the other part Vietnamese. Their leader is Aqualad, canonically Atlantean, but of undeniable African American influence. And as the team grows into Season 2, they are joined by Blue Beetle, a Hispanic superhero; Guardian, another African American hero; Batgirl and Wonder Girl, the young sidekicks of their Justice League counterparts; and Rocket and Bumblebee, both African American female heroes. It’s heartening to see heroes of all shapes, sizes, genders, and races step into prominence—the way it’s meant to be. I call myself a Marvel girl not because I hate DC. I don’t hate DC. It’s because more times than not, DC has disappointed me. But there’s been times that DC has come through, and Young Justice is one of those times. These are the stories of young heroes stepping out of their mentors’ shadows, finding their own place in the world, rising up to meet challenges both too big and too small for their Justice League counterparts. And even though the show was cancelled in 2013, since then it has found new life on Netflix, and there have even been rumours that Netflix will pick it up for a Season 3. So go. Watch. Experience Young Justice for yourself. And who knows? f you love it as so many others do and enough of us are watching it, we just might get that Season 3. Are you interested in watching Young Justice?